Legendary singer-songwriter Bruce Springsteen rocked the crowd tonight during the first concert of his South African tour. According to Yahoo! News UK, the 20-time Grammy award-winning singer and his E Street Band opened the concert with a touching tribute commemorating the late Nelson Mandela. The memorable song was written by British songwriter Jerry Dammers back in the 1980’s. 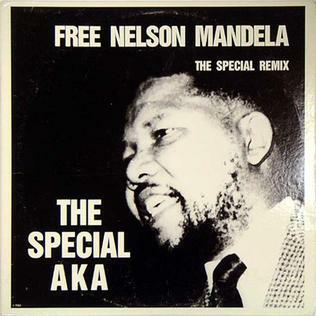 The protest song, which was made famous by the Coventry, England-based ska revival band The Specials, was released as a part of the group’s single Nelson Mandela / Break Down The Door in 1984. The song quickly became a success, peaking at No. 9 on the UK Singles Chart. The lyrics spoke volumes delving into the impact of Mandela’s struggle, while protesting his imprisonment and raising awareness about the injustices of the South African regime. The song went on to garner global notoriety, serving as the unofficial anthem for the international anti-apartheid movement. Mandela died on December 5, 2013 at his home in Johannesburg. He was 95 years old. The performance in South Africa was the first for Springsteen and the E Band since they participated in the Artists United Against Apartheid in 1985 almost 30 years ago. The Mandela tribute was a “nice surprise because it was a personal song for the audience. People were on their feet,” said one fan at the concert, who opted to remain anonymous. Springsteen shared his sentiments of the country’s transformation saying that the progression toward democracy “was a miracle”. He was also elated to be in South Africa saying that it was “very special to be here”. Gwen Ironsi, spokesperson for Big Concerts, also weighed in on Springsteen’s performance. “Bruce Springsteen and the E-Street Band performed to a sold out audience,” said Ironsi. Springsteen and the E Band have three scheduled concerts in Capetown, and one in Johannesburg. The four tour dates South Africa will kick off their world tour as they prepare to travel to Australia and New Zealand next month.